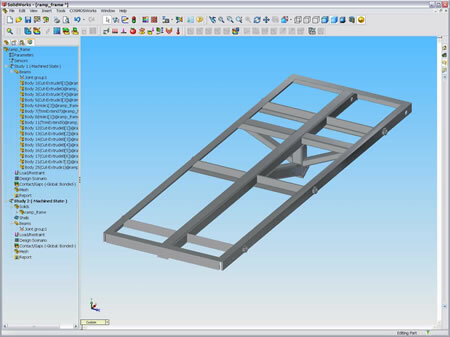 COSMOS 2007 includes a nifty new ability to create finite element models with beam elements. It can take a weldment such as the one shown and, with pushbutton ease, can reduce it to 3D beam elements and nodes. COSMOS will create beams along the length of long thin structures. Cross sectional properties are automatically determined by COSMOS from the solid model geometry. Why is this important? Beam elements are the most efficient way to model objects composed of long thin parts such as trusses, communication towers, space frames and the like. Though modern day modelers can break any part down into solid elements, the amount of solid elements required to model long and thin or flat geometry would be prohibitive. By comparison, beam element models will result in models with orders of magnitude less degrees of freedom, often with equivalent or better accuracy, and take a fraction of the time to solve. But until now, modeling with beams had required recreating geometry. Lines would have to be drawn manually alongside existing geometry. This would often leave endpoints near but not connected to other endpoints. The analyst could then either move endpoints so elements could connect (causing the finite element model to deviate from the geometry and possibly skew the results) or create extra geometry that would tie together the floating endpoints. Either case would result in extra manual work for the analyst. COSMOS 2007 takes the latter approach, automatically creating a rigid element between floating endpoints. Nodes that fall within a sphere of a specified radius will be rigidly linked..
As far as I know, no other vendor has this sort of technology, which will be available to all SolidWorks users (except those who buy the base product). Future releases of COSMOS will be able to create both beams and solid elements in the same model. >"The quote ... is totally inaccurate." Now you know why vendors like to have media days, where their sole message gets directed at journalists.